The city of Shilo held a central place in the history of the Jewish people. During the period between capturing the Land and building the Temple, thousands of years ago in the days when Joshua divided the land among the 12 tribes, the Tabernacle resided in Shilo. The location of the city was important, and until the death of Eli the High Priest, whose tomb is marked in Shilo, Shilo was the place of pilgrimage for the Children of Israel. Three times a year the faithful sojourned in Shilo to bring their festival offerings. Tel Shilo is an archeological site, located in the Ephraim hills of the Shomron where the spiritual life of the Jewish people was centered for 369 years in the 11th and 12th centuries B.C.E. In addition, there are artifacts from other periods, notably the end of the Second Temple (130 B.C.E. - 70 B.C.E. ), the Byzantine period (350 -618), and the early Muslim period (638-900). 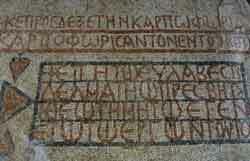 The first archeological excavations began in the years 1922-1932 by a Danish expedition. The finds were placed in the Danish National Museum in Copenhagen. In 1980, Yisrael Finkelstein, an archeologist from Bar-Ilan University, initiated four seasons of digs and many finds were revealed including coins, storage jars, and other artifacts. Many are preserved at Bar-Ilan University. 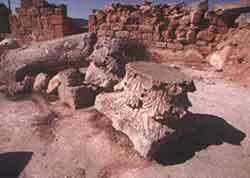 In 1981-1982, Zeev Yeivin and Rabbi Yoel Bin-Nun dug out from the bedrock area of the presumed site of the Tabernacle. Ceramics and Egyptian figurines were found. 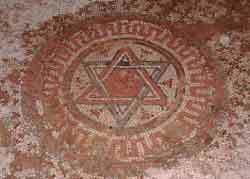 On November 22, 1998, after weeks of excavations around the ancient building of Jama Ithi'im (remains of a Byzantine church), an enormous and well preserved mosaic floor was found. There are plans for the continuation of the excavation, include digging below the floor level to find more evidence of a synagogue. In this ancient home of the Tabernacle can be found remains of thousands year old wine and olive oil presses. The ancient city is encompassed by impressively large city walls, including remains of the city gates and watch towers. Upon approaching the city along the marked path, one can see that the homes were built along identical lines, including storehouses for food and cisterns for rainwater storage. The archeological digs in Tel Shilo revealed large clay jars that still held remains of raisins, scorched during the destruction and torching of the city of antiquity. Closer to the Tabernacle site are underground caves and warrens that tranverse the Tel, including cisterns and bathing pools. On the north-western edge of Tel Shilo, near the location of the Tabernacle, is a unique cave, which was an ancient dwelling place. Additional caves, cisterns and underground warrens branch off from this cave. Inside the cave, on the western wall, can be seen niches for oil lamps or candles. To the west of the cave, near the entrance, there is a ritual bath (mikvah) with six descending steps, as is described the tractate Mikvaot. This place served the priests and Levites who came to the Tabernacle to perform their services  before approaching the Tabernacle compound they purified themselves in the nearby pool. The underground warrens lead to other parts of the Tel. 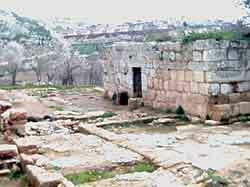 Ancient Shilo's city gates have been identified in the southern side of Tel Shilo. Ancient Shilo was built by the Canaanites who had dwelt in the land; the city was captured by Joshua Bin Nun approximately 3500 years ago. The southern approach to the city was on a gradual rise, with easy access. In the other directions were steep, rocky cliffs, making the city easier to defend. In 1985, the Tel underwent an archeological expedition headed by professor Yisrael Finkelstein, which uncovered the ancient city's guard towers; a Canaanite wall, impressive in its size and beauty; remains of stone houses; and more. In some places the immense width of the city wall can be seen to reach 5.5 meters. The city covered an area of 17 dunam­walking through the city's ruins is fascinating. To the east of the Tel are discernable a well- preserved ampitheatre and the burial grounds of ancient Shilo. The synagogue of the Dome of the Divine presence is located south of the Tel Shilo site on a knoll, from which one can view all of the Shilo valley, the road to Jerusalem, and the mountain chain of Ba'al Hatzor. Rabbi Ashtori Hafarchi reached the site in 1335 and found the building mostly intact. The synagogue is built in the same fashion as those in the Galilee from the Talmudic period. All have three entrances in the northern wall; in the southern wall is a niche for the Holy Ark, facing Jerusalem. In the center of the building can be seen remains of the columns that supported the roof. The outer walls slope inward and reach a height of two meters, giving the building an appearance similar to the Tent of Assembly. Around the entrance are embellishments unique to Jewish buildings, such as olive branches and urns. On the Southern side of Tel Shilo is a building of stones from several time periods. Rabbi Ashtori Hafarchi in his book Kaftor V'ferach tells of passing by and seeing a group of Jews kneeling and praying by a stone weeping and praying. Upon his inquiring, they answered him that this was the burial place of Eli the High Priest. Some hundred years later, the archeologist Dalman in his writings identified the same spot as Eli's burial location. On the Western side of the building grows an ancient fig tree, which is identified as the Shilo fig tree mentioned in the Bible. Upon ascending to the roof top of the synagogue building we see that a venerable oak tree is growing right through the roof. This tree is the only one of it's kind growing in this area, as is mentioned in the end of the book of Joshua as a symbol of the covenant reached between G-d and the children of Israel at the place of the Tabernacle. Inside the synagogue, in the southern wall, facing Jerusalem, is a niche, which was used as a Holy Ark to hold Torah scrolls. The building is also known as " The synagogue of Hannah's prayer," in accordance with what is told in Samuel I Chapter 2, verse 1 "And Hannah prayed, saying my heart rejoices in the Lord, my horn is exhalted in the Lord, my mouth is enlarged over my enemies, because I rejoice in thy Salvation." In the book of Joshua, chapter 18 verse 1 it states: " The whole congregation of the Children of Israel assembled together at Shilo and erected there the Tent of Assembly, and the land was conquered before them. The first two principles are archetectural rules governing the character of a public building such as the Tabernacle. It is logical to assume that initially the Tent of Assembly was housed in a transient sanctuary, as it had been during the desert years. The Tabernacle was located in Shilo for 369 years. According to the Talmud (Zevahim 119,) during the course of the years, a more permanent structure was erected to house the Tabernacle in Shilo. In the Mishna (Zevahim 14) it states: " And in Shilo there was no roof, but a building of stone below and cloth above, and it was a resting place." In 1873 the explorer Wilson suggested the northern plateau of Tel Shilo as the possible site of the Tabernacle. In aerial photographs it is clear that there is an area north of the Tel that was hewn for some specific purpose. According to Wilson's measurements, the plateau is 77 feet long, i.e. 235 meters. Therefore, this location fits that all three requirements for identifying the site as that of the Tabernacle, dimensions, direction and naturally defendable. There is great topographical similarity between this location and the location of the Temple on Mount Moriah in Jerusalem. both are enclosed by steep descents into valleys, with high hills surrounding the valleys; the southern approach is more gradual. The Temple is not on the summit of the mountain, but is beyond the summit, northward, at a lower point, in accordance with the words in Leviticus exhorting, "And you shall not go according to the practices of the nations, which I cast out before you". The other nations placed there altars on the highest mountain tops. The children of Israel's custom was different, as is seen in Samuel II, chapter 24, when King David's prophet, Gad tells the King, "Go up, erect an alter to the Lord on the threshing floor of Arniya the Jehusite." From a national, religious viewpoint, there is no doubt that the identifying of the location of the Tabernacle in Shilo is of paramount importance, strengthening the Jewish people's bond with their past.